A Centro de Enseñanza, Investigación y Extensión en Producción Avícola, Facultad de Medicina Veterinaria y Zootecnia, Universidad Nacional Autónoma de México, Ciudad de México, México. B Departamento de Medicina y Zootecnia de Aves, Facultad de Medicina Veterinaria y Zootecnia, Universidad Nacional Autónoma de México, Ciudad de México, México. This study evaluated different levels of metabolisable energy (ME) and two oil types: crude soybean oil (CSO) and acidulated soybean oil (ASO), in sorghum-soybean meal diets for broilers. One thousand and eight unsexed Ross 308 chicks aged 1 to 49 days old were used in a factorial arrangement design 2x3. The first factor corresponded to the oils (CSO and ASO) and the second factor corresponded to the ME levels (high, medium and low) in the initiation (1-10 days), growing (11-25 days) and finishing (26-48 days) feeds, with a 90 kcal/kg reduction. The treatments were as follows: (1) CSO with 3010, 3175 and 3200 kcal/kg; (2) CSO with 2920, 3085 and 3110 kcal/kg; (3) CSO with 2920, 3085 and 3200 kcal/kg; (4) ASO with 3010, 3175 and 3200 kcal/kg; (5) ASO with 2920, 3085 and 3110 kcal/kg; and (6) ASO with 2920, 3085 and 3200 kcal/kg. The treatments with high and medium levels of ME (P<0.05) were higher. The carcass weight and skin pigmentation when cold were better in broilers fed with high and medium levels of ME (P<0.05). No effect (P>0.05) between oil types was found. It can be concluded that it is feasible to replace CSO by ASO and to reduce 90 kcal/kg of ME from the recommended amount for the breed during the initiation and growing stages, without affecting their performance. Metabolisable energy (ME) is considered the standard measure used to describe bird requirements. In diets offered to broilers, the ME plays an important role because it is used for catabolism, maintenance and production (Abudabus et al 2014, Sakomura et al 2014). Feeding programs are established based on ME requirements; therefore, nutritional strategies are sought in order to optimise productivity in the economic aspects during the production cycle (Andreoti et al 2004, Baião 2005). The crude soybean oil (CSO) is used as a concentrated source of energy in balanced food for birds; however, due to its cost, several effective alternatives are sought such as lower-cost acidulated oils that have an acceptable nu tritional quality (Barbour et al 2006, Carrillo 2013). The acidulated soybean oils (ASO) are by-products of the refining soybean oil process for human consumption. 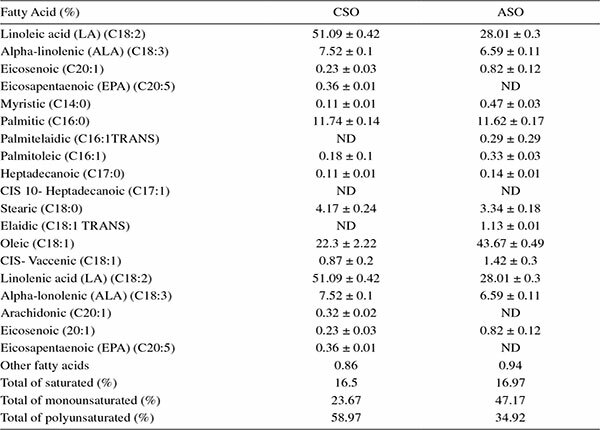 The disadvantage of this oil is its low quantity of linoleic acid, linolenic acid and total of polyunsaturated fatty acid when compared to CSO; however, ASO has a higher amount of total monounsaturated fatty acid and oleic (table 2). Also, ASO is cheaper than CSO. During the process, free fatty acids (responsible for the acidity) are separated by the addition of NaOH; subsequently, they are separated using a decanting-centrifuging method and the resulting pastes are neutralised with sodium sulfuric acid. Finally, they are washed with abundant water in order to drag the excess of sulfuric acid, dried and cleaned by decantation (Cuca et al 2009). The ME level in the diet of broilers, is one of the main factors in the regulation of voluntary feed intake and feed conversion. According to Lesson and Summers (Leeson and Summers 2005), in ad libitum fed chickens the feed intake increases or decreases due to low or high ME levels in the diets. The composition of fatty acid profile in oils is very important because it is has been shown that absorption of pigments (xantophyls) are better when the oils have unsaturated fatty acids. The mixture of polyunsaturated fatty acid and saturated fatty acid in oils, increases the absorption of lipids, improving the absorption of pigments (Fraser and Bramley 2004). Therefore, another important parameter to consider is the skin pigmentation. It is well-known that appearance is one of the most important factors affecting the consumer’s choice, and has been long recognised as a critical quality attribute for the marketing of chicken carcasses. Feeding costs in birds have been increasing in recent years and the cost of energy is the most expensive nutrient on the diet (Cuca et al 2009). This requires finding specific and effective alternatives for having an adequate level of energy in broiler diets, without affecting production pa rameters and obtaining savings in diet formulation, that is the case of replacing the CSO by oil byproducts such as ASO, wich is 40-50% cheaper. This experiment was designed to better understand the ME requirements and the feeding behaviour in Ross 308 chickens. Modern birds may present a good behaviour using low ME levels in diets, according to those levels recommended for the Ross 308 breed. Caloric restriction (90 kcal/kg of ME) was studied, comparing to the Ross manual, in three different feed stages (0-10, 11-25 and 26-49 days of age), as well as the use of two oil types (crude soybean oil vs acidulated soybean oil) in order to reduce the cost of the diet and also evaluate broiler performance, carcass yield and skin pigmentation. The research was conducted at the Center for Teaching, Research and Outreach of Poultry Production (CEIEPAv.) of the Veterinary Medicine and Zootechnics Faculty, Universidad Nacional Autónoma de México. One thou sand and eight mixed chickens from the Ross 308 breed, aged one day-old were divided into six treatments; each treatment had six repetitions with 28 birds. The birds were housed in 36 compartments or metal grid corrals. A com pletely randomised experimental design was used with a 2x3 factorial arrangement; the first factor was represented by the oils (Crude Soybean Oil (CSO) and Acidulated Soybean Oil (ASO), and the second factor corresponded to the three ME levels (high, medium and low) with a 90 kcal/kg reduction in the initiation, growing and fin ishing stages or only in the initiation and growing stages (table 1). Table 1 ME (kcal/kg) treatments for initiation, growing and finishing stages and energy sources. 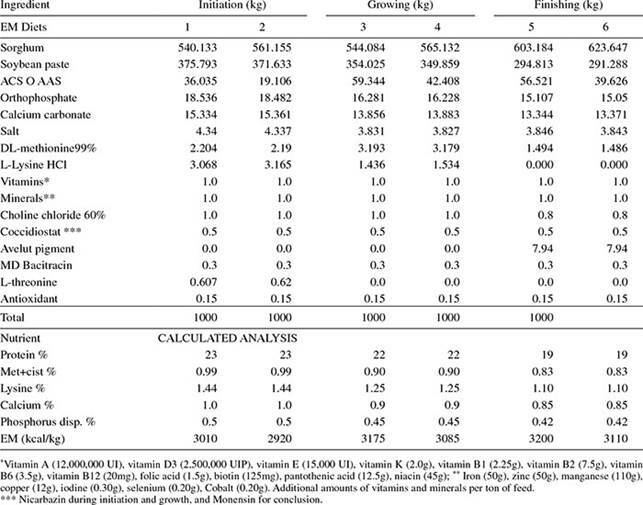 Sorghum + soybean meal diets were formulated for the three production stages: initiation (0-10 day-old), growing (11-25 day-old), and finishing (26-49 day-old), which covered all the nutrient recommendations (except for metabolisable energy) according to the Aviagen handbook guidelines for breed and production stage (table 2). The ASO was used in the diets as a replacement for CSO (kg/kg). Table 2 Composition of the experimental diets for broilers during initiation, growing and finishing, with different ME content. Prior to initiating the study, fatty acid profile analyses were performed in CSO and ASO samples following the procedures outlined by Carrillo-Dominguez (2013). The results of these analyses are shown in table 3. Weight gain, feed intake, feed conversion, and mortality data were recorded. At the end of the study, two birds from each replicate of each treatment were sacrificed to determine carcass, breast and leg-thigh yields. Before slaughtering them, the birds were subjected to 8 hours of fasting and then weighed individually before hanging them on hooks for slaughtering poultry. They were desensitised using a commercial stunner under the perimeters of 25 volts, 0.25 amps and 460 Hz of a direct pulsed type current. The slaughter was performed by unilateral neck cut in order to be bled out during 2 minutes. Immediately, they were scalded in a water tank at 53 °C for one minute, and then they were introduced into an automatic plucker. Evisceration was performed manually, circularly cutting the cloaca and making a second perpendicular cut to the cloaca cutting, to facilitate the removal of viscera. The gizzard, intestines, liver, heart, spleen and maw were extracted in order to finally obtain a rotisserie type carcass. The carcasses were weighed to calculate yield percentage, as well as breast and leg- thigh bone performances. Skin pigmentation (yellowness) was measured on the cold carcasses of ten birds (for each repetition per treatment) after processing, with a CR-400 Minolta reflectance colorimeter, on the lateral apteril region (vein's fatty). Table 3 Fatty acid profile for crude and acidulated soybean oils. The data obtained from the study variables were analysed under a completely randomised design with a factorial arrangement 2X3; first factor: two sources of oils and second factor: three levels of ME. The statistical differences between treatments were analysed through mean comparisons using a Tukey test, and considering a significance of (P<0.05). The SPSS statistical package version 17 (SPSS 2010) was used for the statistical analysis. The average results of the 1 to 21 days old chickens corresponding to weight gain, feed intake, feed conversion and mortality are shown in table 4. It is possible to observe that there was no effect (P>0.05) on the energy factor, however there was an effect on the oil factor regarding weight gain and food intake (P<0.05). Table 4 Productive parameters in 1 to 21 day-old broilers fed with ME different levels (High, Medium and Low) and sources (crude soybean oil and acidulated soybean oil) of energy. Table 5 shows the average weight gain, feed intake, conversion and mortality data of the 1 to 49 day-old chickens for the energy and oil factors. Regarding the energy factor, a difference was observed between treatments (P<0.05), where the birds fed with a high and medium ME amounts presented a higher weight gain compared to those fed with the lower ME amount. The low ME amount treatment obtained 6.6% and 6.3% less weight gain compared to the high and medium ME amount treatments. Table 5 Productive performance in 1 to 49 day-old broilers fed with ME different levels (High, Medium and Low) and sources (crude soybean oil and acidulated soybean oil) of energy. Feed conversion results for the oil factor showed a difference between oils (P<0.05), with a better conversion in the animals treated with crude soybean oil than those treated with acidulated oil; however, there was no difference in weight gain, consumption and mortality. Regarding the carcass and breast and leg-thigh per formances, no significant differences were observed in the factors (P<0.05). However, for the energy factor there was a difference (P<0.05), because skin pigmentation was lower (less yellowness for 2 points) in birds fed lower ME diets. In contrast for the oil factor, there was no difference between the two oils (P<0.05), data can be seen in table 6. Tabla 6 Average performance data of the carcass and body-parts (breast and thigh-leg performance, and yellowness of the skin day-old broilers. The energy factor influenced weight gain because low ME diets had a lower weight gain and carcass yield in comparison to birds fed high and medium energy diets; even the latter had similar results. These results were similar to those found by Andreotti et al 2004, who attributed this effect to the increased consumption of ME. This data partly agrees with the reports of Skinner et al (1993), who did not find any energy effect on the productive performance of broilers when they used two levels of ME for three production stages, and observed that there was not any significant alteration of the energy diet on the productive performance of 49 day-old birds. Similar results were also obtained in an experiment conducted by Hidalgo et al (2004), who did not found any differences in weight gain and feed conversion when the diet ME de creased from 3196 to 3020 Kcal/kg. Furthermore, Lopez et al 2011, did not find any significant differences for the 90 kcal/kg reduction in the initiation and growing diets. However, the production parameters were significantly affected due to the caloric restriction in the diet during the completion stage. On the other hand, Sizemore and Sigel (1993) reported a better growing and feed conversion at the completion stage in chickens fed with high ME diets (3190 kcal/kg). However, Pardío et al (2001) evaluated acidulated oils from different sources, finding that acidified soybean oil had a better weight gain response in birds fed during 1 to 7 weeks, indicating that the use of this acidulated oil is a viable alternative for feeding broilers. Baião (2005), recommends the use of acidified soy bean oil as a substitute for vegetable oil, as a source of polyunsaturated fatty acids. However, other authors note that this energetic ingredient has a 10% lower energy value of ME on average (Sizemore and Siegel (1993). The ME factor data showed a higher weight gain and carcass weight gain in birds fed high and medium ME amounts; these results agree somewhat with those reported by Barbour et al (2006), who conducted an experiment with broilers where the ME levels were 3.3%, using two production stages only (0-21 and 22-49). The results indi cated a growth improvement in birds fed a high energy level diet. They also emphasised that the differences between treatments were more evident in the second feed stage in comparison to the first; these evidences coincided with our results, since the most noticeable differences occurred during the last production stage. Regarding consumption, no treatment differences were found which contrasts with the research of Dozier et al (2006), who observed that the consumption decreased proportionally (falling 5.2%), by decreasing the energy content of the ration, from 3383 Kcal/kg to 3023 Kcal/kg. The different results can be explained by the ME amount in diets because in the present work the ME was reduced 90 kcal in each phase, whereas in the study of Dozier et al (2007), they observed a 10% reduction, which also affected other production parameters (e.g. body weight). Our results also differ from those obtained by Leeson et al (1996) and Lara et al (2008) who found a consumption decrease as the dietary energy level increased, highlighting that the bird is capable of regulating the consumption. During this study, this regulation might not have occurred because the ME reduction was 90 kcal/kg only. In the study performed by Dozier et al (2007), two ME levels were used. The first level contained 3220 Kcal/kg, whereas the second level contained a higher contribution of ME (3310 Kcal/kg). The results showed that the ME decreased in 2.9%, and the consumption and growth pa rameters did not change significantly between treatments. Also, feed conversion was influenced by the ME amount, since the birds treated with lower amounts of energy were 4.6% less efficient than those fed with medium and high energy amounts. Therefore, the results of this study agree with Lesson and Summers (2005), who indicated that birds fed with high ME levels obtained a higher feed efficiency. It can be concluded that both chicken and carcass weight, and skin pigmentation decreased by reducing 90 kcal/kg of ME during the initiation, growing and comple tion stages. The use of acidulated soybean oil proved to be an alternative for crude soybean oil in broiler chicken diets in order to reduce the cost of diet. Finally, it is pos sible to feed the chickens with reduced ME diets during the initiation and growing stages, without affecting the productive performance, carcass and skin pigmentation. *Corresponding author: A Cortes-Cuevas; Manuel M. López S/N, Col. Zapotitlán, CP. 13209, México; cortescuevasarturo@yahoo.com.